An average office space typically contains a break space, workstations, offices, and a reception area. If we are being honest, the waiting area is everyone’s least favorite, albeit - it is an important part of the office space. This makes the impression of the waiting area so impactful. A entry area should function as a comfortable and welcoming area for guest to wait. The waiting area should also function as an introduction to your business. This may sound like a daunting task to design the perfect waiting area. Foot traffic is an important element to consider when designing the waiting area. Clearly marked entrances and exits assist in providing a good flow of traffic. Arriving at an office without a clue where to go, can be frustrating. Several offices have a separate entrance and exit to keep traffic moving smoothly. The design of the waiting area should avoid any bottlenecking or too many patients crossing paths. The furniture in the waiting area is important because it is the first impression. The furniture also adds to the comfortability of the waiting area. The more comfortable the visitor are the less impatient they tend to become. The reception area should be the main focus and in plain view. The pathway to the reception area should be easily accessible from the entrance. An organized waiting room gives the right impression. 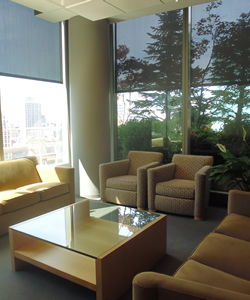 A clean and inviting waiting room is typically free from scattered paperwork, packages, and opened boxes. The wants and needs of your business factor into the shape and type of desk required. If you have a business with confidential information, an elevated front desk will benefit employees’ maintenance of privacy. When choosing the design of the reception desk, consider the finish, details, and décor of the reception area. Wood grain laminate is durable; details such as plexi-glass or steel are added to the desk. Most important, as with any piece of furniture, is to measure everything. Proper measurements ensure the desk and furniture will fit perfectly in the space. Seating in the waiting area should look professional and engaging to entertain visitors. Measuring the seating and space will help maximizing the available seating in the reception area. When choosing seating, consider how waiting seats will be used on the busiest day, with enough room for an end table. When measuring the area be sure to include room for foot traffic without any obstructing furniture. Seating pattern should also be considered when designing the waiting area. Many visitors do not like sitting with their backs to the door. Choosing an arrangement that allow visitors to choose how they want to interact is best. A - Is the seating comfortable? Would a visitor be uncomfortable sitting in the seats for 20= minutes? The best solution is to test the chairs yourself. B - Are the seat accommodating to visitors of all sizes, mobility, and age? Consider those things when deciding on armrests or not. C - What fabric and upholstery is best for the office? Engineered fabrics are harder wearing than natural fabric especially in high traffic areas. Vinyl seating finished with Permablok® is protected against stains, abrasion, and germs. This type of seating is favored by the healthcare industry due to its cleanliness. D - Lastly, your budget is the greatest determiner for the reception furniture. If there is a deadline for when the furniture is needed by, do not forget to give yourself adequate time. Décor adds to the aesthetic of the waiting area and boost the furniture. The décor should reflect your business and pander to your visitors. Choose impactful décor to create a memorable space. Consider an aquarium, a water feature, or a tasteful art piece to add interest to the space. A unique waiting area can offer the ideal impression to your visitors. Additional information about your business is excellent reading material to display in the waiting area. Lighting is a valuable mood enhancer in any space. The lighting in the waiting area has a great effect on the comfort of the visitors. Soft, bright lighting is ideal for a business setting. It fosters a sense of calm and interest in display items. If you want a more “homelike” vibe for the waiting area then low, warm lighting is perfect. Avoid fluorescent lighting, as it is harsh and off-putting. Ideally, natural lighting in the reception area is best. Natural lighting make the space appear larger and more connected to the outdoors. The guest seating area is the place for guest to wait, although many guest will want to continue working. For this reason, the presence of outlets is greatly important. Easily accessible outlets to charge any technology (i.e. iPads, laptops, and phones) is essential to the waiting area. Guest accessible Wi-Fi is a wonderful amenity and do not forget to place the password in plain view. Technology is also great to promote your business while the guest wait and work. Including flat screen televisions or tablets may also present some essential information and even have virtual tours. If you are having any difficulties beginning the design of your guest seating areas, we can assist you with this process! Placing yourself in their shoes is a great way to design the best guest seating area. Catalog the experience of sitting in the waiting area also request other employees do the same and report their experiences. Are you looking to design a brand new guest seating area or renovating the old area? What information did you find helpful in making decisions about décor, colors, and furniture? Is this a project you did on your own or did you have assistance? Please let us know about your experiences and any way information that may help others with this endeavor.